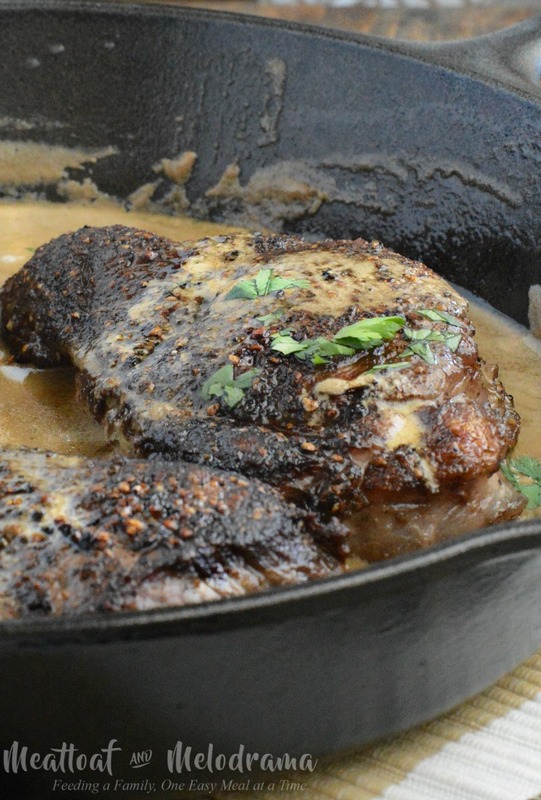 Easy Steak au Poivre in a rich bourbon cream sauce takes 15 minutes to make. 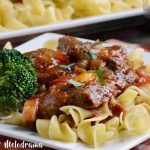 It’s a simple but elegant dinner that’s perfect for special occasions! 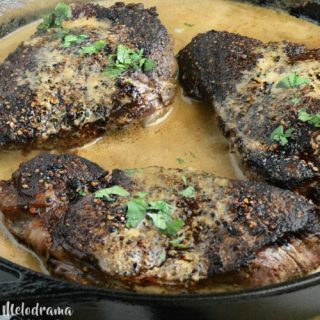 If you’re looking for a quick and easy dinner that’s gourmet enough for a special occasion, you’re gonna love this easy steak au poivre recipe! And if you love beef and bourbon, you’re gonna be in heaven! It’s perfect for Father’s Day, Mother’s Day, birthdays, anniversaries or whenever you want something extra special. Don’t be put off by the fancy French name. It’s basically just a thick-cut filet mignon with a crust of crushed peppercorns that’s seared over high heat and then topped with a rich creamy sauce. It only takes a little more than 10 minutes to cook, and it’s actually very easy to make. In other words, it’s a quick and easy meal. Not gonna lie though — this is rich, peppery and not exactly budget friendly. We actually used 3 fillets and cut them into smaller pieces. Serve it with a salad and your favorite potatoes or easy ginger glazed carrots, sauteed green beans or asparagus, and it’s the right amount. Or if you have a really big appetite, eat a whole one. No judging here! I made this easy steak au poivre for our anniversary a couple of months ago. Yes, we actually ate at home instead of going out. See, it’s way cheaper to make a delicious steak dinner at home instead of going to the restaurant I had in mind. Way, way cheaper! Plus, I would have had to order pizza or something for the kids, which is even more moolah. Since I was really craving an amazing steak dinner, I decided to try the steak au poivre recipe from a Williams and Sonoma cookbook that I’ve had since the Hubs and I were first married. I thought it would be difficult, but it wasn’t at all. In fact, I was really surprised that something so easy could taste so special! Basically all you do is crush some peppercorns and press them into the beef fillets. Next, you sear the meat over high heat, then let it rest while you make the sauce. And that’s it! I used bourbon instead of the traditional cognac because that’s what we had. Besides, the smell of bourbon heating up is amazing! I also cooked the fillets for exactly 5 minutes per side, which is slightly longer than most recipes called for. We just don’t like our steaks to be mooing! I also let the meat simmer in the sauce for about a minute before serving. 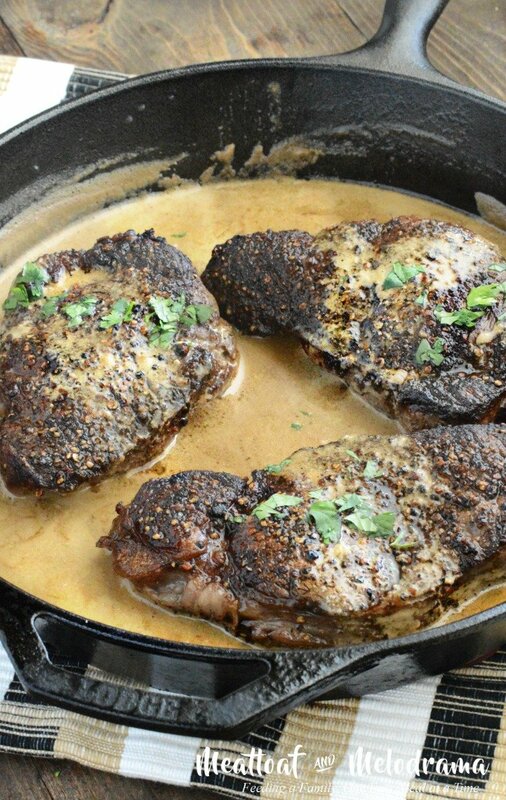 Easy Steak au Poivre smothered in a rich bourbon cream sauce features peppercorn crusted beef fillets seared over high heat and covered with a creamy sauce. 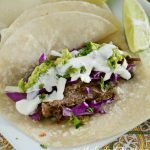 It's a quick and simple but elegant dinner that takes just 15 minutes to make! 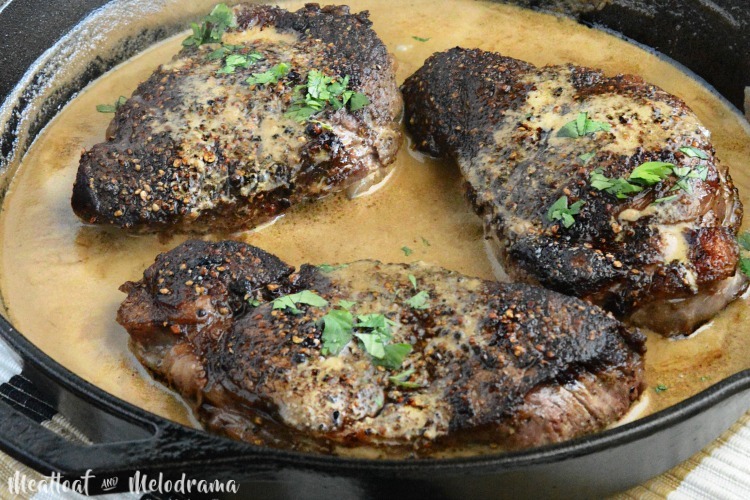 The Hubs and I absolutely love this easy steak au poivre. Honestly, it’s a little more peppery than the kids like, but for us, it’s perfect! I hope you enjoy it as much as we do! Sharing this recipe at the Weekend Potluck! A rich creamy bourbon sauce?! Someone hold me. I wish I had this sauce at every meal! 😉 Seriously though how great would it be over some potatoes or pasta as a side to that steak?? Fairly positive we would lick that sauce off our plates! SO GOOD! Yum! What a delicious blend of flavors for the sauce! 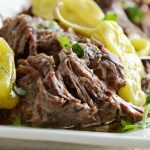 I love that peppery steak recipe! I’m seriously going have to make this for my husband for Father’s Day. He orders steak au poivre at restaurants so I know he’d be thrilled if I made it at home! Steak au poivre with bourbon sauce sounds like the ultimate in delicious decadence. Perfect for a special occasion! Your Steak will be delicious! Thanks so much for sharing your post with us at Full Plate Thursday. Have a great weekend and come back to see us real soon!